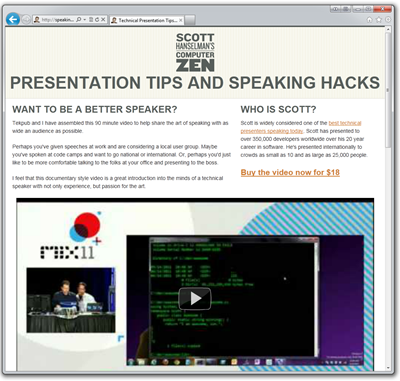 I recently did a video with Rob Conery on how to be a better technical speaker and blogged about it. I wanted to put up a site for this video to give people more details and to make it easier for me to get the word about about the video separate from Tekpub. I went and bought http://speakinghacks.com and fired up WebMatrix to do a quick one-pager. An easy to remember domain name. A site that looks kind of like my existing site, to keep the branding cohesive. Cool I've got some existing CSS. Site should look good on mobiles and tablets so I want to use responsive design. A site that includes the free trailer for my video that plays on any device, including phones and tablets. A site that resizes cleanly, rotates cleanly and the video thumbnail is always as large as possible. For stuff like this, I now always started with a decent boilerplate. There's even group knowledge and experience that there's little reason for me to New Blank HTML File these days. There's others, and the nice thing is that you can get started with a template like this in minutes, not hours, so go find one that makes you happy. I picked Skeleton, then with a little magic help from Jzy and a late night Skype (go visit his http://programmerryangosling.tumblr.com site, by the way!) we brought in a few elements from my currently blog template so the general look and feel is still there. VideoJS - A really nice and image-free HTML5 video player with a series of templates that can make it look like Vimeo or YouTube or others. Works everywhere. SublimeVideo - Free and pretty but they have a few sign up things if you serve hundreds of thousands of views. jMediaelement or "jme" - Clean, basic, simple, open. Flash fallback and semantic code. These are all great but if you've already got your video up on YouTube, Vimeo, Blip or another video sharing site, you might just want to make that existing video embed resizable. For that, you can use FitVid, a small jQuery plugin that will take effectively any video element and make it resizable and usable in a responsive design. To create a 16:9 ratio, we must divide 9 by 16 (0.5625 or 56.25%). Anders M. Andersen has a nice clean example of this with the CSS, so I ended up with this markup. Only the embed-container class matters in this context. The other containers are used by Skeleton. So now, when you visit http://speakinghacks.com in your desktop browser or your mobile browser, you'll have a lovely experience. I think I only spent about 2 hours total on this site. Taking advantage of existing CSS wisdom and standing on the shoulders of giants is absolutely the way to go for layouts. I'm totally sold on Responsive Design and am planning on including it on all my sites whenever possible. http://mediaqueri.es - Check out this wonderful gallery of sites that use Media Queries to work great at any size. Congrats to my designer Jeremy Kratz on our inclusion in this gallery. Adaptive Web Design by Aaron Gustafson - A fantastic book on progressive enhancement. It's really a lovely book, I recommend it highly. Sample chapter and more details at http://easy-readers.net. P.S. As an aside, if you bought the video, drop me a line if you liked it and maybe I can put your review on the site! 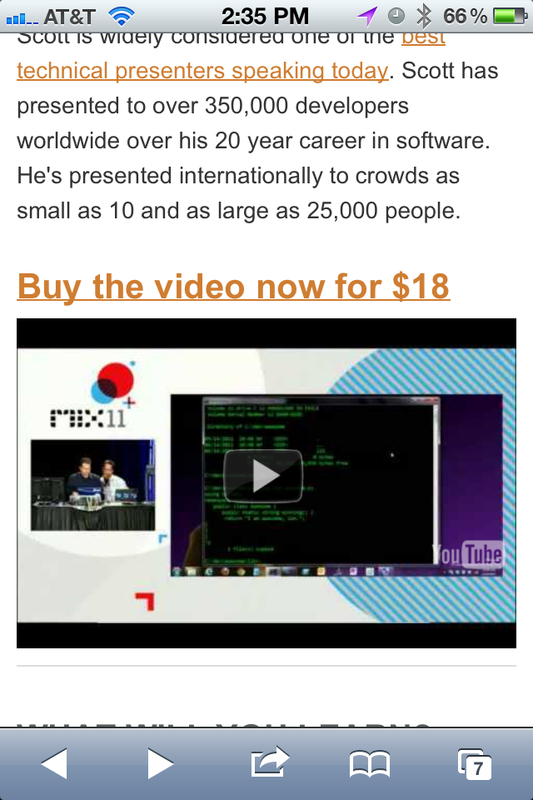 Also feel free to write a review at SpeakerMix if you've seen me speak before. One challenge in responsive design not touched on here is the problem of how to serve up optimally sized videos and images based on the size of the viewport. 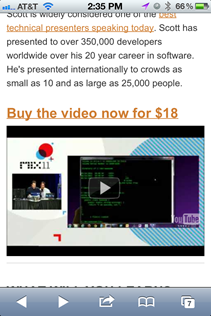 PayPal is a valid payment method on tekpub.Used it several times. I signed up for TekPub to watch your video (and because other content there looked good) - enjoyed the "behind the scenes" perspective on your presentations, particularly since I've given a number myself and have always remarked at how thorough-yet-engaging yours consistently are... They've always been good motivation and I've even re-watched some Hanselminutes just to see how you handle some topic transitions. The video itself validated a lot of what I practice (I even carry my own cables & converters), but I'd still like to know more about how you do what you do... How do you stay motivated? How do you adjust for broadened audiences (I.e., execs + geeks)? How long would you normally speak before interjecting levity or a mental digestion point? As for TekPub, I have one major annoyance - the DRM or whatever that's going on in the background seems to timeout after 45 minutes, even if you're watching a stream. The only way to make it through your video is to go back to the page, refresh, then start the stream again, provided you remember exactly where you left off. I often view your site on my iPad and iPhone and I'd hardly call them mobile friendly. The biggest complaint I have is removing the ability to pinch/zoom to increase the text size. I don't have bad eyesight, but sometimes I need to zoom in on small type fonts or images to see them better. I've noticed an increasing trend in sites to disable the zooming ability on iOS (I've not tried other devices). Related to that is the reflowing of text instead of adjusting the viewport size. Sometimes to get the text size to increase I'll turn my iPhone or iPad landscape. On most sites this keeps the text in the lines the same but increases the size of the font to fill the space. On your site the text flows to fill the space without resizing. I really wish site coders would just stick to a single site and avoid pushing specific device versions. I've not come across a single site that doesn't render/work properly on iOS unless that site is sending device specific markup. @Alex I; You were right. Just bought the video with PayPal! Wow, thanks so much for this. Was exactly the answer I was looking for and works like a dream. Oh how I love it when you do a search and it comes up trumps right of the bat. It works. Nowadays responsive design is essential and has become compulsory. It is good to find tutorial about making youtube video responsive.